Going on holiday? What happens to your cat? Cats Protection champions neutering as the only effective way to reduce the number of unwanted cats in the UK. We seek to dispel myths, spread the neutering message and make it easier for owners on low in comes to get their cats neutered. Last year our charity helped neuter 158,000 cats and in the Camberley area we neutered over 200. Neutering is a surgical procedure carried out under anaesthetic. In a male cat, both testes are removed from small incisions made in the scrotum. In females, the uterus and ovaries are removed via an incision either on the left side or underneath. The neutering process - will it hurt? Modern anaesthetics and pain relief mean that the process is really painless these days. Many vets also operate using a tiny incision on the left side of the cat, reducing pain in comparison to the equivalent procedure in dogs or humans. 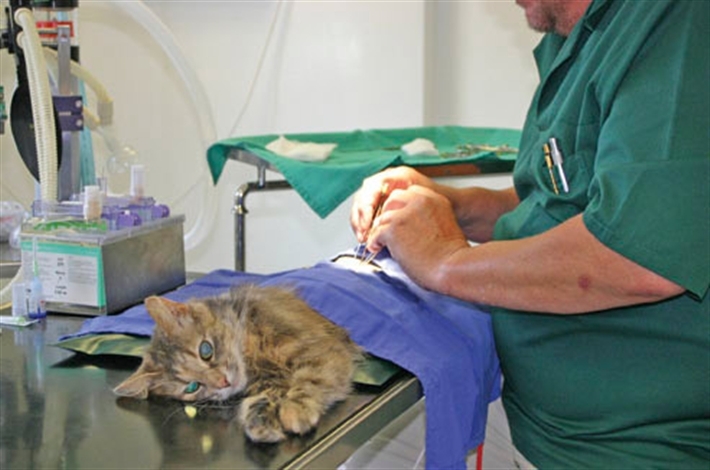 Vets will also give the cats pain relief injections covering the period after surgery. If you are unsure, please speak with your vet. What aftercare will my cat need after the operation? The vet will probably advise you to keep the cat indoors for a few days after surgery. It may need to wear a buster collar,a plastic lampshade shape collar to stop it chewing its stitches. Stitches may need removing after seven or 10 days, or may be dissolvable. Male cats have no sutures and are normally able to go outdoors again within two days of surgery. In the longer term, cats will have a lower energy requirement and so will need less food. How will my cat benefit? The cat will be less likely to wander, stray, call (if female), spray (if male). The chance of contracting some infectious cat diseases will be reduced, as will the likelihood of developing mammary tumours (breast cancers), pyometra (life threatening womb infections), testicular cancer, and many other illnesses. Male cats in particular will improve in physical body condition and their urine will smell less pungent! Early neutering is proven to be a safe and effective method, avoiding many of the potential complications of neutering later in life. There is no evidence to show that it inhibits growth, or causes urinary problems, and experience show kittens resume their normal activities and routines after surgery much more quickly than adult cats. Our branch provides help with neutering cats in situations where there are many cats in a household. We take a non-judgemental approach, recognising that in these cases fast action is needed. To achieve success we are reliant on owners cooperating with us throughout the process.